Commonly used for : Fixed Deposits, Interbank Deposits, Structured Deposits, Current Account, Savings Account. 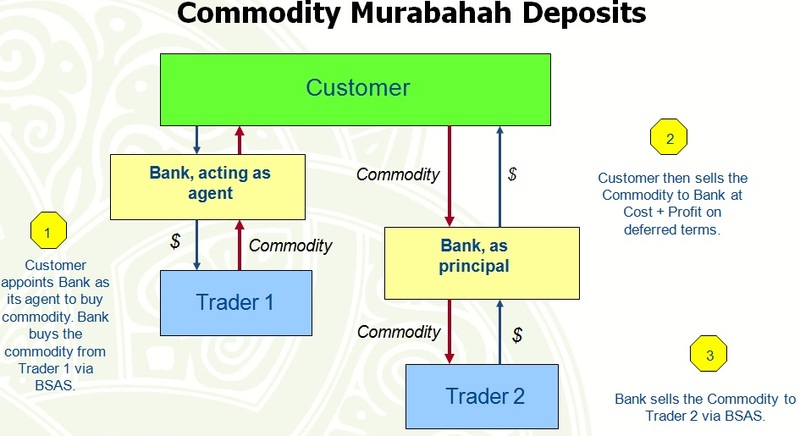 While it is fairly common to see Tawarruq Arrangement (monetization of Murabahah sale-based transaction using Commodities) in financing structure, Tawarruq has also be widely used in deposit products in Malaysia, especially after the introduction of the Islamic Financial Services Act 2013 (IFSA). The biggest impact of IFSA is defining “Deposits” as structures where the Capital amount is guaranteed and “Investments” as structures where Capital amount is not guaranteed. Up to 2013, most of the deposit products are based on Wadiah (safekeeping) or Mudarabah (profit-sharing). With Mudarabah then classified as “Investments” as Capital is not guaranteed (resulting in loss of cover by PIDM ie the Deposit Insurers Association of Malaysia), the market demanded the introduction of a product where the Capital is guaranteed and for the purpose of income generation. Thus, the industry evolved into offering Deposit products based on Tawarruq. There are also Banks in Malaysia already offering Current Account and Savings Account based on Tawarruq, and moving forward, a lot more is expected to emerge in 2017-2018. The fore-runner of Tawarruq deposits is Hong Leong Islamic Bank (Malaysia), where a huge majority of its deposit and financing products are offered under the contract of Tawarruq. Qard – the deposits taken shall be classified as a loan transaction, as the Bank tends to deploy the deposits into the interbank market. This means the contract of Wadiah (used for Current Account and Savings Account) is no longer suitable as there are questions of the allowance of the deposits to be used by the bank without obtaining consent from the customers. Without the consent, the bank is hard pressed to justify using the funds for banking purposes. With Qard, the arrangement is “loan” where the customer lends cash to Banks and transferring ownership to the Bank to deploy the sum. However, by virtue of loan, no returns can be promised or agreed up-front, and this pose a challenge to attract deposits. Marketing activities are limited for Qard, as there is no value proposition compared to other products. Wakalah / Mudarabah / Musyarakah under Investment Account – BNM had reclassified in 2014 the above products as “investment” where capital is not guaranteed. For customers who has been banking with Islamic Banks, they now realise under the above contracts, the capital is at risk. Returns are not guaranteed as well. The reliance of the performance of the venture may not be everyone’s cup of tea. Following the issuance of the BNM Policy Documents for Tawarruq in 2015, Banks has started to re-look at current practices to ensure compliance to the requirements. Over a period of time, Banks have been able to stabilise the operationalisation of Tawarruq in deposit products. BNM also conducts regular checks for compliance to the minimum requirements and while there have been lapses identified, it was promptly addressed by the Banks. The Bank should decide on a structure where it is either a single Wakalah (Agency) process or dual Wakalah (dual Agency) process. The Agency appointment must be stand-alone arrangements from the Murabahah agreement and the sequencing of such appointment must be strictly adhered to. Any delays in transacting the Commodity trade should not exceed 2 days. 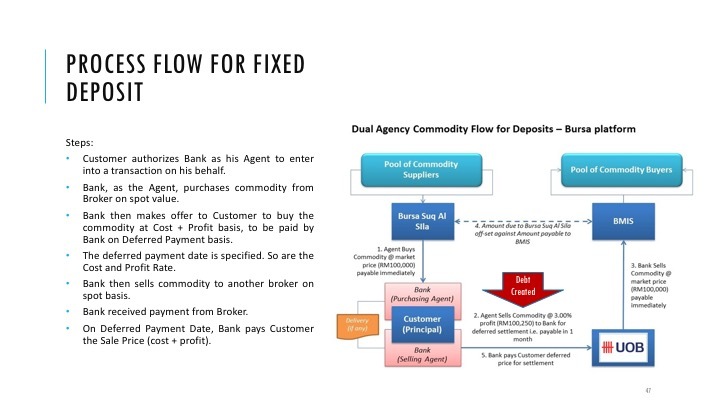 In such circumstances, Hamish Jiddiyah (security deposit) can also be deployed by the Bank as guarantee to enter into Commodity trade at a later date. Banks can choose either to purchase commodity based on incremental value only (with probably a higher ceiling purchase with rebate to adjust against actual daily amounts) or on actual daily end-of-day amount (trade done daily basis, irregardless if there is any incremental value to the deposit). In any structure, the bank’s internal processes and system must be able to support it adequately. Each of the commodity trade must provide sufficient evidence in trade, and sufficient notification on the completion of trade, as well as the payout of the returns on the agreed dates of maturity. 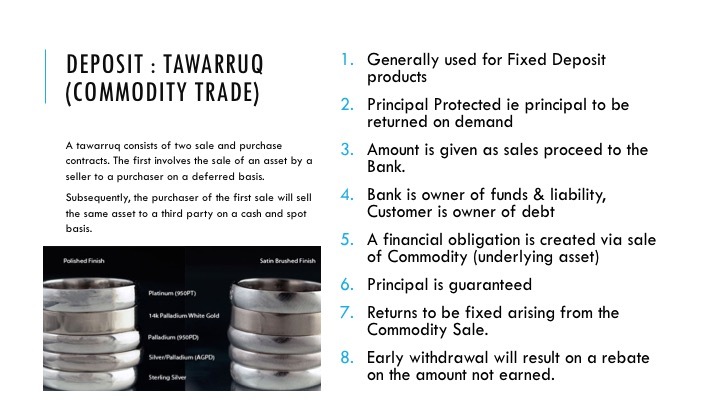 The processes for Tawarruq must demonstrate the compliance to the minimum tenets of a valid sale ie. Buyer, Seller, Underlying Asset, Price and Offer/Acceptance (Aqad). The uncertainties of the above must be properly addressed by banks offering such products.